Our local children's library asked me once again to come this summer and teach a class. 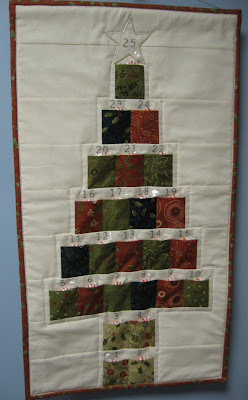 In last year's class, the girls learned how to make a quilted pillow. In the previous year's class, they learned how to embroider a journal cover. 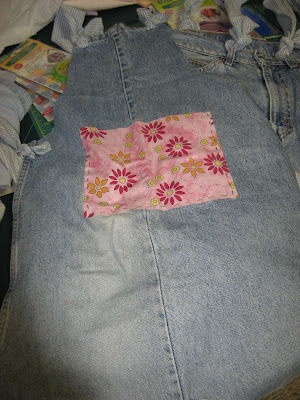 This year's theme for the summer reading program is "Going Green" so I will be showing the children in the class how to upcycle a pair of old jeans into three different items. 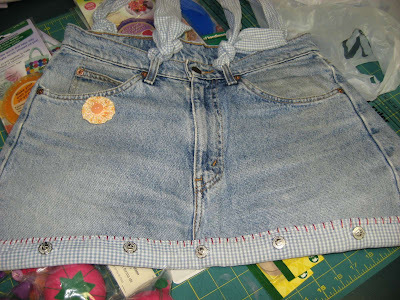 I've shown a few things here before that have been made from old jeans, such as aprons, a child's art smock, clothes pin bags and drawstring bags. These examples will all be shown to the children in the class, but the items I am going to guide them in making will be a tote bag, an apron and a cute little over the shoulder purse. Shopping for all the supplies for this class has been so fun! Would you like to see all the goodies the students will receive? Keep reading! Here's my sample tote bag made from the top of an old pair of jeans and the button band of an old lightweight gingham shirt. I tore two strips from the shirt back to be used as the handles for the tote bag. Since there will be no sewing machines in use for this class, I had to do all the stitching by hand to make sure it would work, and that the children would also be able to do it. I used perle cotton to do the red stitching to hold the button band on and close up the bottom of the tote bag, and the handles were just tied to the belt loops. 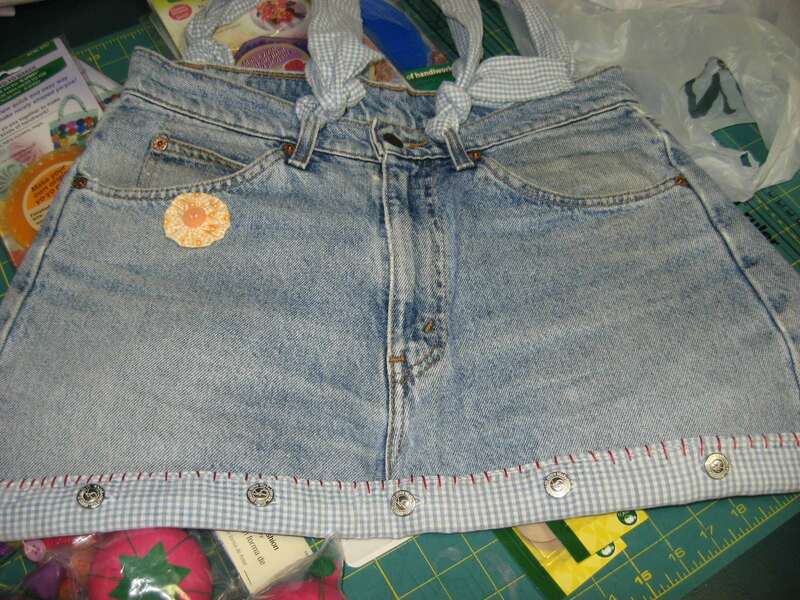 This is the apron I will show the class, made from one of the legs of the jeans and two more strips of fabric from the old shirt. I just cut slits into the jeans and tied the strips on for the neck strap and the ties around the waist. The pocket is hand stitched to the denim using perle cotton. I don't have a picture of the little over-the-shoulder purse because my own little 5 year old bag lady, Grace, has decided she really likes it and just cannot wait until the last class to claim it as her own. I do need to find it before Thursday night though! I hope she didn't forget where she put it! It's actually my favorite of the three projects. So each of the students will receive their very own yo-yo maker in either small or large size. Joann's didn't have enough of either size so I got half of each. The students can share sizes in class and then pick one to keep. 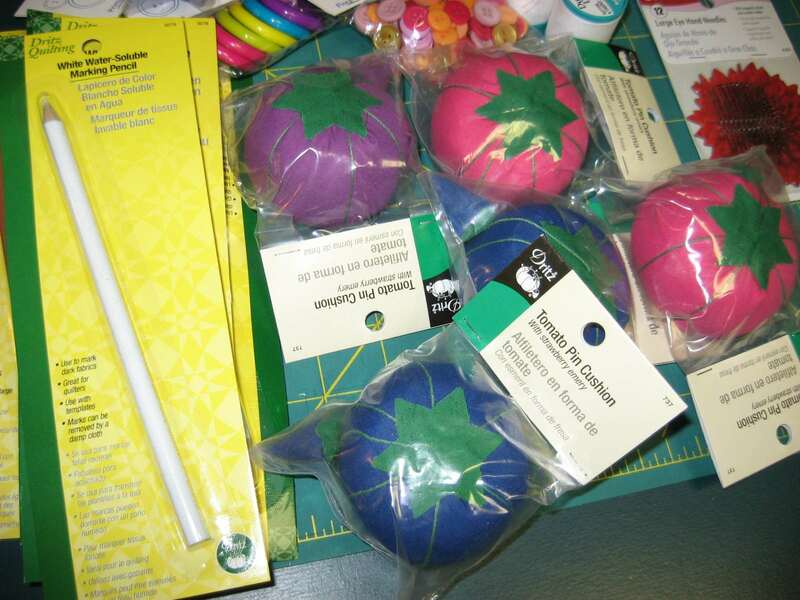 Yo-yos will make fun and creative decorations for the upcycled items they will be making in this class, and can also be used later for lots of other clever projects. 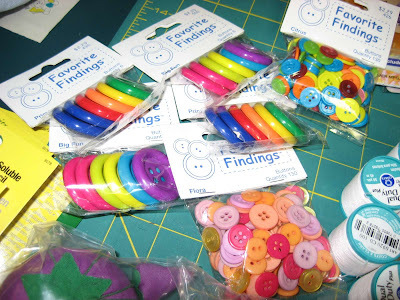 A great assortment of buttons is always a fun thing to have on hand when doing projects like this. It's amazing to see how creative kids can get with buttons! Each student will receive a white making pencil to help with drawing out the cutting lines on their jeans before jumping in with the scissors. 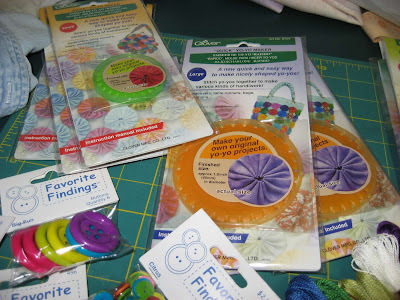 Having their very own pin cushion will make them feel like they are truly creative stitchers, so they will each get one pin cushion complete with a lot of long straight pins. Since we will be using perle cotton and sewing through layers of denim, each student will receive a large eyed sharp needle and a rubber needle puller. 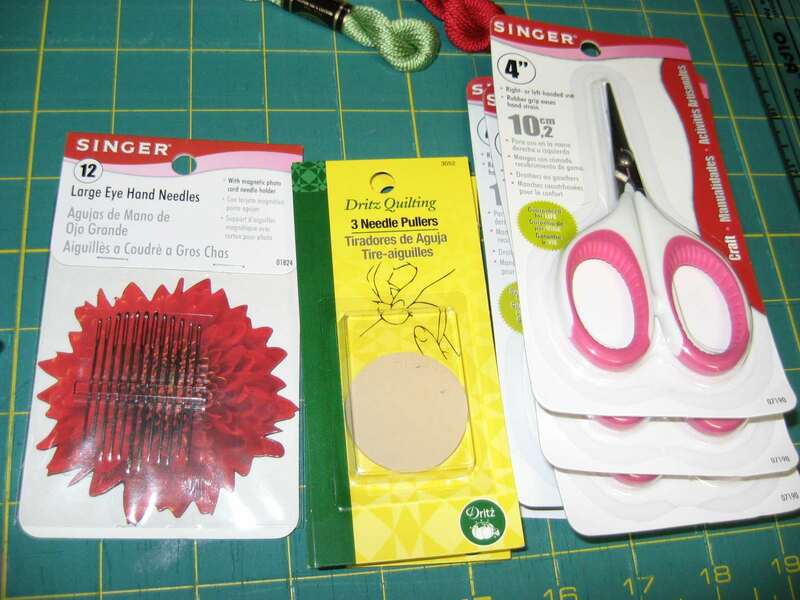 A good sharp pair of scissors for thread cutting is essential for a well stocked sewing kit, so I picked up one pair of 4 inch Singer scissors to go in each kit. 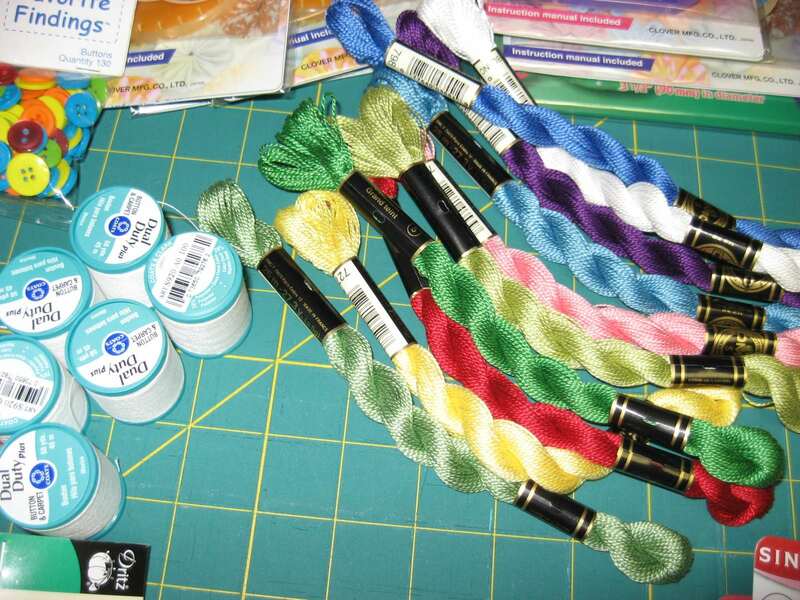 A spool of thread for each kit, plus an assortment of colorful hanks of perle cotton that they can share in class will round out the kits. 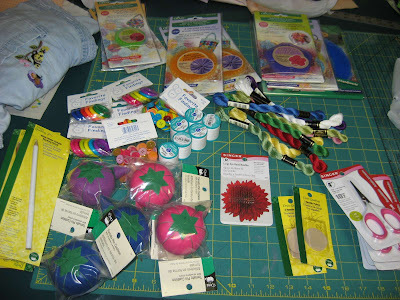 So this is all the stuff I purchased to make up the sewing kits for the students. All I need now is a nice little box to put it all in. I noticed that all the back-to-school merchandise is beginning to show up in stores now, so I will pick up some of the handy little plastic pencil cases I used in last year's class to complete each kit. 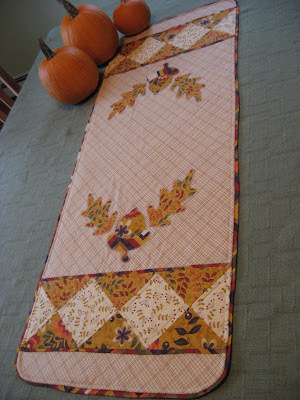 I will be bringing my own cutting mat, rotary cutter, straight edge, good fabric cutting scissors, and iron, along with a variety of fabric pieces, which the students will have the opportunity to learn how to use and make use of during the class. They will be bringing their own pair of old jeans to cut up. If you can think of anything else I might have missed, please don't be shy! I'm always open to suggestions! While shopping for class supplies, I also picked up a few things for myself which I will show you another time. Our local Joann Fabric was having a 50% off sale on all quilting notions and cutting supplies, plus sales on just about everything else I bought, so I was able to get most everything at half price, plus another 10% off my entire purchase including sale items because of an extra coupon. So my final bill of about $115, which included the items I purchased for myself, reflected a savings of $93! Now that was a great shopping trip! Hot summer weather has descended upon New England and looks like it is here to stay. My two youngest have begun two weeks of swimming lessons and we are making preparations for our own upcoming family vacation and one young man's first cub scout camp adventure, so I can't seem to find much time for sewing or other projects down in my cool sewing room. When I do though, I'll be sure to share it all right here with you! Hope you are having a good summer too! Don't forget to sign up for my giveaway! It's open until sometime on Friday, July 9, so click HERE to check it out! Holy smokes if I were closer, I'd sign up for the class - those kids are going to have a great time! I wonder if you should take an extra pair or two of jeans ... just in case? I can't think of any other supplies they're going to need - you've set them up with such great goodies - the only thing I can think of that might come in handy would be some assorted trims they could embellish with? And - if there are going to be boys in the class, I'd bring along a couple of pairs of non-pink scissors, lol! looks like you are going to have so much fun with the kids!! Looking forward to seeing more pictures! !